Started up a few minutes ago. The small earthquake that struck Yellowstone National Park on Thursday night was part of a swarm that has been hitting the area since Monday, scientists say. 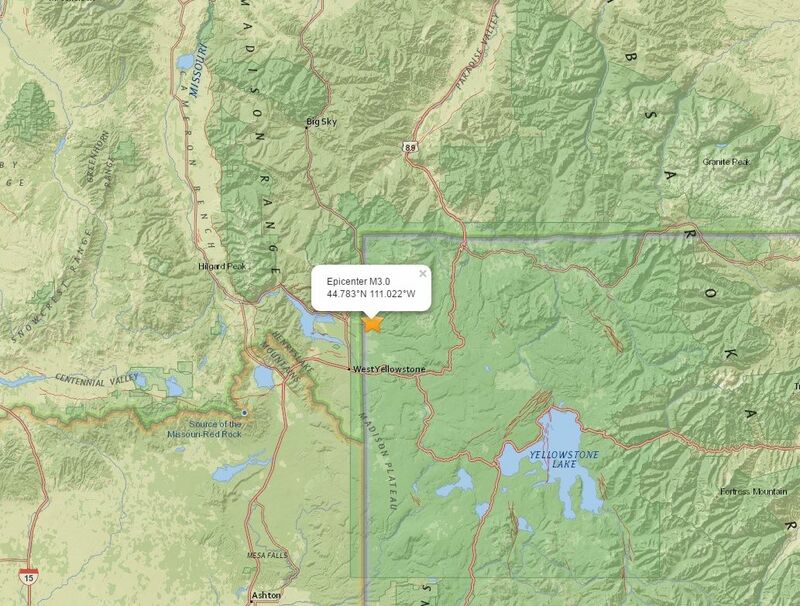 The quake was centered near West Yellowstone, but was also felt by people in Gardiner and Bozeman. “As of 10 a.m. this morning we had located a total of 235 earthquakes in the area,” said Jamie Farrell, University of Utah research professor of seismology. Yellowstone gets about 1,500 to 2,000 earthquakes every year. About half of those come in earthquake swarms — lots of earthquakes in a small area in a short amount of time. So this activity is fairly normal, Farrell said. Most of the earthquakes in this swarm have been small — only four above magnitude 3. Thursday’s 4.5 magnitude earthquake was the only one reported to the U.S. Geological Survey website, meaning people actually felt it. 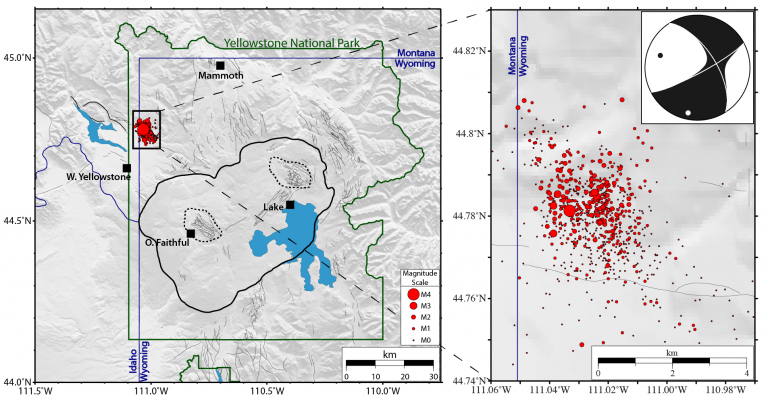 Not only was Thursday’s quake the largest in the current swarm, it was the largest in the area since March 30, 2014, when a 4.8 magnitude earthquake hit near Norris Geyser Basin, according to a news release from the University of Utah Seismograph Station. Farrell said the swarm is the effect of normal tectonic stress in the Earth’s crust. As of Friday morning, his the University of Utah seismologists weren’t seeing anything volcanic in nature. 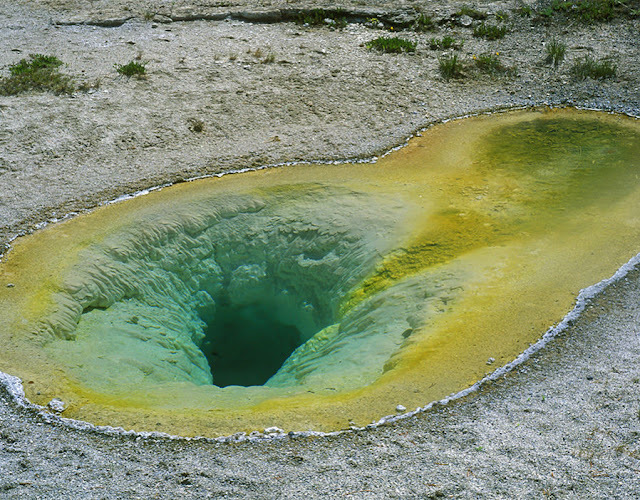 Yellowstone National Park is home to a large volcano and the site of the largest and most diverse collection of natural thermal features in the world. It’s impossible to predict when this current earthquake storm will end. “These things could turn off in a heartbeat, or could last for months. Most go for a week or two,” Farrell said. Farrell urges people to report any activity they feel to the USGS’s “Did you feel it” website, which help scientists record and understand shaking. People can also watch earthquake activity live at www.quake.utah.edu. 10% chance of massive eruption. U.S. Geological Survey (USGS) seismology reports conclude that a massive swarm of earthquakes swept through the park on Friday triggering more than 60 separate events in which seismographs spiked to magnitudes of up to 5.0. Scientist concur that the last eruption of the caldera took place some 640,000 years ago. 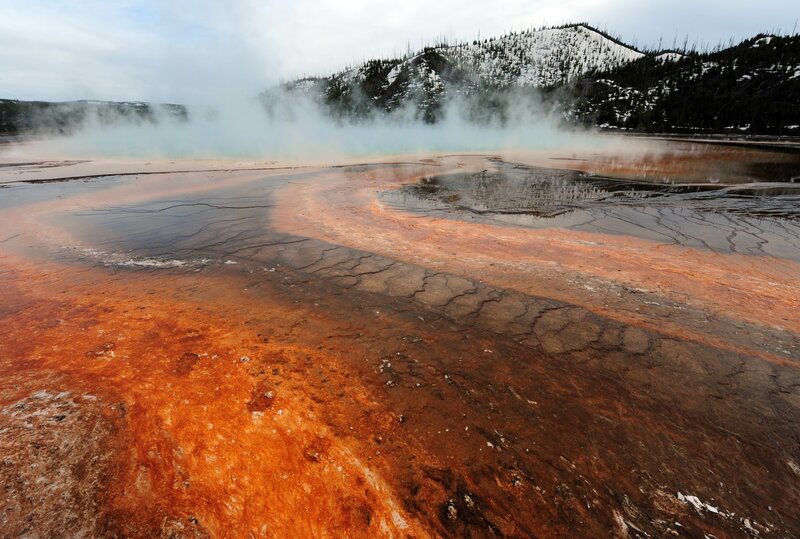 The U.S. is currently under contract with at least 4 countries all of which have agreed to house displaced U.S. citizens in the unfortunate event the Yellowstone supervolcano were to erupt. Hundreds of billions of dollars were paid to foreign governments to facilitate the agreement which spans a ten year period from its signing, ending in 2024. The calm before the storm started a few weeks back when researchers noticed a downtick in seismic activity before Friday’s swarm struck. Updated | Yellowstone supervolcano has been hit by a series of earthquakes, with more 400 recorded since June 12. The latest was recorded on Monday, June 19, with a magnitude 3 earthquake striking 8.6 miles north northeast of West Yellowstone, Montana. The swarm began last week, and on June 15 saw a magnitude 4.5 earthquake take place in Yellowstone National Park. “The epicenter of the shock was located in Yellowstone National Park, eight miles north-northeast of the town of West Yellowstone, Montana,” scientists from the University of Utah, which monitors Yellowstone Volcano, said in a statement. This earthquake was the largest to have hit Yellowstone since March 30, 2014, when a magnitude 4.8 earthquake was recorded 18 miles to the east, near the Norris Geyser Basin. As of June 19, 464 events had been recorded. Most of these ranged in the magnitude of 0 to 1, with five less than zero, indicating they occurred at depths ranging from about 0 miles to about 9 miles. "This is the highest number of earthquakes at Yellowstone within a single week in the past five years, but is fewer than weekly counts during similar earthquakes swarms in 2002, 2004, 2008 and 2010," scientists said. The University of Utah is part of the Yellowstone Volcano Observatory (YVO), which monitors volcanic and earthquake activity in Yellowstone National Park. Seismic activity at volcanoes can signal an eruption is due to take place, although predicting exactly when a volcano will erupt is, at present, impossible. Experts at the U.S. Geological Survey (USGS) say the risk of an eruption at Yellowstone supervolcano is low—the current volcano alert level remains normal and the aviation color code, which provides information on the potential risk to fights, is green—meaning the volcano is in a normal, non-eruptive state. The probability of a large eruption at Yellowstone in the next year is currently calculated at one in 730,000. But what would happen if it did erupt? In 2014, scientists with the USGS published a report where they modeled what would happen if a large, explosive eruption took place at the supervolcano. Their findings showed most of the country would be covered in a blanket of ash, with some areas being buried up to a meter deep. 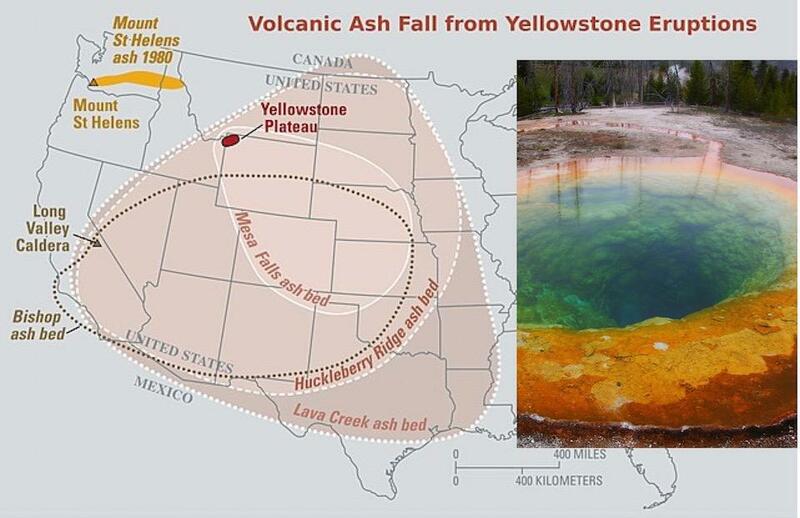 However, the USGS also said that if Yellowstone were to erupt, it would likely be far smaller than the one modeled. They also described what would concerning signs of activity would constitute: "Yellowstone hasn't erupted for 70,000 years, so it's going to take some impressive earthquakes and ground uplift to get things started,” the team said in a press release. "Besides intense earthquake swarms (with many earthquakes above M4 or M5), we expect rapid and notable uplift around the caldera (possibly tens of inches per year). 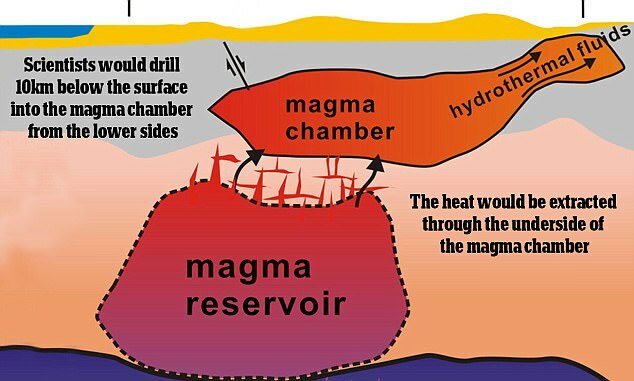 Finally, rising magma will cause explosions from the boiling-temperature geothermal reservoirs. Even with explosions, earthquakes and notable ground uplift, the most likely volcanic eruptions would be the type that would have minimal effect outside the park itself." This story has been updated with the current number of events since the swarm began, per a statement from the USGS on June 19, and an explanation about earthquakes with a magnitude of less than zero. 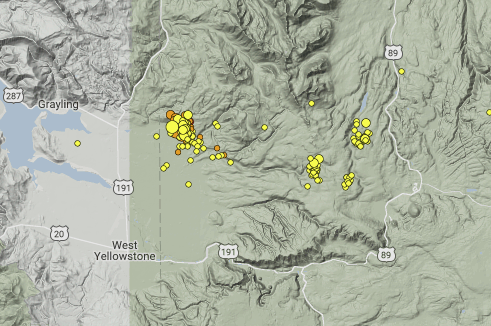 Updated | Over 800 earthquakes have now been recorded at Yellowstone supervolcano over the last two weeks, with the ongoing swarm taking place on the western edge of the National Park. But there is virtually no risk of the volcano erupting, the United States Geological Survey (USGS) currently lists the volcano alert level as normal and the aviation color, which lists the potential risk to fights, is at green. The current earthquake swarm began on June 12. A week later, the USGS put out a statement to say that 464 earthquakes had been recorded, with the largest being magnitude 4.4 “This is the highest number of earthquakes at Yellowstone within a single week in the past five years,” it said. Yellowstone View of the 'Sunset Lake' hot spring in Yellowstone National Park. Scientists have recorded over 800 earthquakes in the last two weeks at the site. However, in a newly released statement about the ongoing swarm, seismologists from the University of Utah said 878 events have now been recorded at Yellowstone National Park. The University of Utah is part of the Yellowstone Volcano Observatory (YVO), which provides long-term monitoring of earthquake and volcanic activity in and around Yellowstone National Park. Jamie Farrell, Research Professor at the university, said that as of June 26, 878 events had been recorded as part of the ongoing swarm. “The swarm consists of one earthquake in the magnitude 4 range, five earthquakes in the magnitude 3 range, 68 earthquakes in the magnitude 2 range, 277 earthquakes in the magnitude 1 range, 508 earthquakes in the magnitude 0 range, and 19 earthquakes with magnitudes of less than zero,” the latest report said. An earthquake with a magnitude less than zero is a very small event that can only be detected with the extremely sensitive instruments used in earthquake monitoring. While increased seismic activity can signal a volcano is about to erupt, the latest earthquake swarm is no cause for concern. Jacob Lowenstern, the scientists in charge of the YVO at the USGS, tells Newsweek the swarm has slowed down considerably, and that larger swarms have been recorded in the past. “The swarm in 2010 on the Madison Plateau lasted at least three weeks. In 1985, there was one that lasted several months,” he says. “Yellowstone has had dozens of these sorts of earthquake swarms in the last 150 years it's been visited. The last volcanic eruption within the caldera was 70,000 years ago. For magma to reach the surface, a new vent needs to be created, which requires a lot of intense geological activity. Farrell also says the earthquake activity is nothing to worry about: “This is definitely not the biggest swarm ever recorded,” he says. “The largest swarm ever recorded in Yellowstone occurred in October of 1985 and lasted for 3 months and had over 3,000 located earthquakes in it. In January of 2010 there was a swarm that had over 2,000 located events in it that lasted for about a month. Yellowstone View of the 'Grand Prismatic' hot spring in Yellowstone National Park. He says they are not seeing an “volcanic signatures” that would indicate an eruption could take place. “This looks to be a ‘tectonic’ swarm in that these earthquakes are due to slip on small faults/fractures in the crust. There doesn’t look to be any evidence at this point that these earthquakes are related to the movement of magma in the subsurface. "Having said that, we will continue to monitor this swarm just in case we start seeing those things. 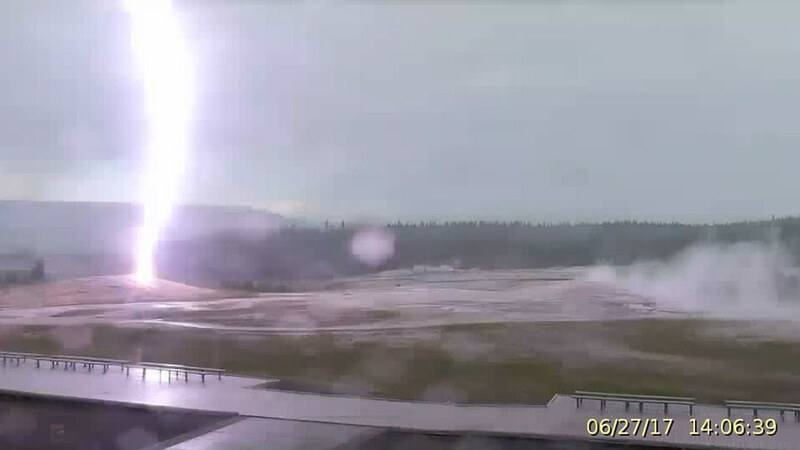 June 27, 2017: Nearby lightning-strikes have taken down the live-stream camera. We are currently working to determine what all got affected, and how to get the camera back online. Please be patient as we work through this problem. In the meantime, here's one of the nearby strikes that the webcam did capture. Note: Just three hours after this broadcast, a 5.8 (est.) magnitude earthquake struck near Lincoln, MT. What is taking place in and around the Yellowstone area, and how do these recent events compare over time? What is going on in Peru with respect to recent archeological finds? Watch and see for yourself whats being hid at Yellowstone. Big time volcanic activity whats happening at Yellowstone today with recent seismic activity off the charts. A NASA plan to stop the Yellowstone supervolcano from erupting, could actually cause it to blow... triggering a nuclear winter that would wipe out humanity. As we have detailed recently, government officials have been closely monitoring the activity in the Yellowstone caldera. However, as SHTFplan.com's Mac Slavo details, scientists at NASA have now come up with an incredibly risky plan to save the United States from the super volcano. after a days worth of rest of quakes it looks like things are ramping up again. 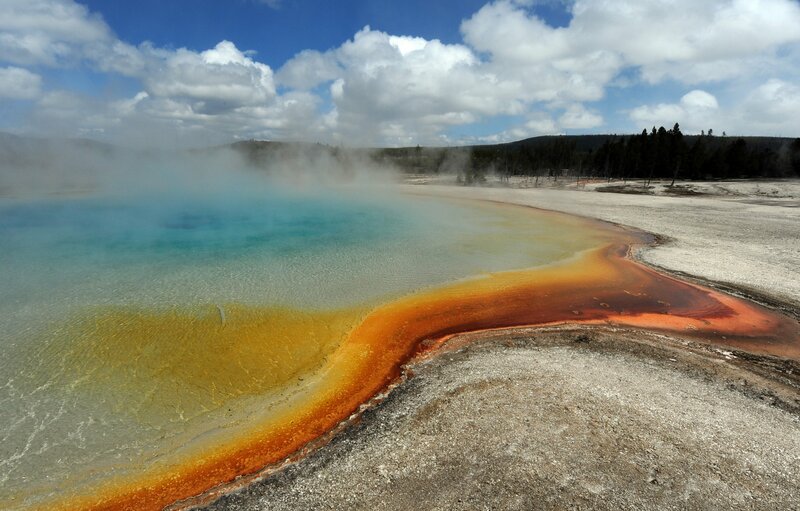 "Yellowstone volcano eruption: 'Life or death' prep for supervolcano emergency underway"
Yellowstone National Park Public Affairs confirmed that there could be a supervolcano eruption imminently - and that they were putting themselves through their paces so that they were ready for any eventuality. 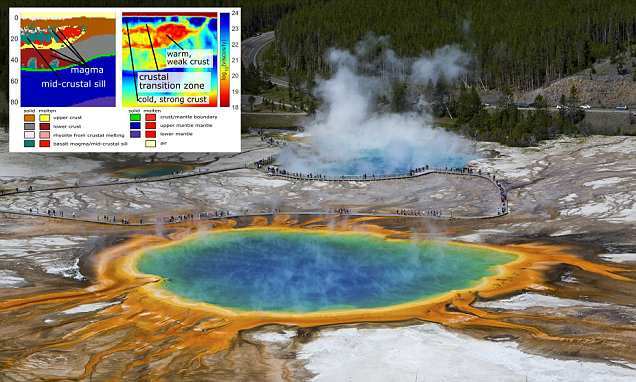 A detailed map of the bubbling magma below the Yellowstone supervolcano could help experts reveal when the next deadly eruption may happen. The monstrous volcano - which last erupted around 640,000 years ago - has dual magma chambers. Now, a new computer model has revealed a 'transition zone' that may control the movement of magma in these chambers. The new research doesn't currently reveal when the next eruption might happen, but it could help scientists put together predictions in the future. 'This is, for the first time, the numerical look at how magma distributes itself in the crust,' study co-author Ilya Bindeman, a geoscientist at the University of Oregon told Live Science. The model suggests opposing geological forces are pushing against each other at depths of three to six miles (five to 10 km). This has created a transition zone where cold rocks are giving way to the hot molten rocks below. 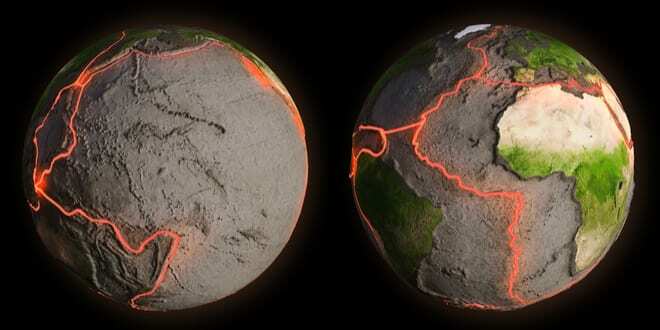 The transition zone, also known as a 'mid-crustal sill' is trapping the magma. As a results, it solidifies into a large horizontal area that is around nine miles (15 km) thick. The study, which was published last week in the journal Geophysical Research Letters, was led by Dr Bindeman's doctoral student, Dylan Colón. 'He was able to choose parameters which were both realistic for Yellowstone and the ones which match geophysical observations and also geochemistry,' Dr Bindeman said. The crust over Yellowstone moves around 0.8 inches (2 centimetres) a year due to the movement of the North American tectonic plates. 'This modelling tells you with maybe half a kilometre [about a third of a mile] resolution where the magma is and what is the composition of this magma, how much magma, etc.,' said Dr Bindeman. The new research provides a never-before-seen look that helps explain the structure of the magmatic plumbing system that fuels these eruptions. With more detail the model could predict future eruptions and how severe they might be, researchers say. Over the past weeks, fears have sparked over a possible eruption at Yellowstone’s Supervolcano. The panic is being fueled by the Steamboat Geyser at Yellowstone National Park, which has erupted three times in the past six weeks. This is Steamboat geyser erupting for approximately 25 minutes. Note that the steam and water is bringing up rocks. It is throwing out rocks. This eruption happened 2 days ago. OMG! I've moved from one active volcano near to another. We have had these alignments and not much has happened so maybe it will be nothing. However, if you live in an earthquake prone area, it might be a good idea to have a plan. The time span on this is about 30 days from July 19 onward. If there is an earthly release, let's hope it's not Yellowstone.